We're used to extravagant claims from tech firms: the biggest this, the fastest that, the most advanced whatever. But this week we have some big claims we can actually back up. We've seen the world's most powerful smartphone, the world's most popular augmented reality game and the world's doomiest Doom, and we've been charmed by Nintendo news that'll gladden the hearts of gamers of a certain age. Not only that, but we've seen firm plans for phone tech that'll make today's 4G networks feel like tin cans tied together with string. 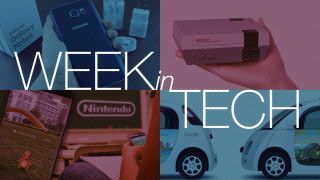 It's an especially future-focused Week in Tech! What's incredibly addictive and just added seven billion quid to Nintendo's market value? It's Pokemon Go, of course – the game that's got old people complaining about young gamers bouncing around the great outdoors, trying to catch 'em all. The app is just days old, and it's already been implicated in dangerous driving, alleged armed robberies and trespassing, so it's just a matter of time before it's the subject of a tabloid BAN THIS SICK FILTH campaign. But what lessons can Nintendo learn from the app's success? Parker Wilhelm knows: it needs to be at the forefront of AR gaming, and it's time for Nintendo itself to evolve. It's been a great week for Nintendo fans: after what seems like years of doom-mongering headlines that recall Apple's lowest ebb, the Ninty news is suddenly all good. Not only is Nintendo's stake in Pokemon Go making it big bucks, but it's re-releasing a genuine gaming icon: the NES. If the NES Classic Edition looks smaller than you remember it's not because you're bigger – it's because the 2016 incarnation is a lot smaller while retaining the iconic looks. It plugs into your TV via HDMI, it comes with 30 built-in games and a controller, and it costs just $59.99 (around £45, AU$99.95). Sadly the games it comes with can't be supplemented: like the original, the 2016 NES doesn't do internet. Matt Swider has everything you could possibly want to know about the incoming Galaxy Note 7, which is the not-confusing-at-all successor to the Galaxy Note 5; maybe the next one will be the Galaxy Note eleventy-two. There's a curved screen, an iris scanner and – eek! – a smaller battery. The official launch is on August 2, and of course we'll be covering it in great detail – but why wait, when we already know everything you need to know? Bragging rights don't last long in the world of smartphones, so we've got bad news for anyone who's feeling pretty damn good about their Snapdragon 820 processor: there's a new dragon in town. The Snapdragon 821 is Qualcomm's new flagship processor, and it's already in a phone: the Asus Zenfone 3, which comes with 6GB of RAM and is currently the most powerful smartphone in the world. It's not the best, though: the screen isn't as detailed as those of rival flagships, and the incoming new Nexuses (Nexi? ), Note 7 and Sony Xperia X2 may use it to even better effect this year. Britain may be leaving the EU, but right now it's still part of the European family – and that means the new European Commission '5G Manifesto' is an important look at the future of communications across the continent. It's backed by all the major telcos and includes some interesting detail, including a rollout by 2020, a big wad of investment, and connections not just for phones and PCs but for connected cars and the Internet of Things too. It's not all good news, though: the manifesto suggests that, as in the US, net neutrality is headed for the dumpster. Other than food, most of the things we buy come from China, and it's never been easier for Chinese firms to sell direct to Western customers. But can you trust Chinese suppliers who operate far from the reach of EU consumer protection law? Desire Athow has some words of warning, and those words include 'import duties', 'post-purchase support' and 'tech differences'. We'd also add 'fire', given some of our experiences with dirt-cheap no-name electronics. Sky Q is getting UHD just in time for the new football season: the opening fixture will be the first live 4K broadcast on Sky's platform, and there'll be plenty more 4K content, including major movies and TV series. You'll need a Sky TV Silver box to get the UHD content, and it's unclear whether the Sky Q Mini boxes will also get UHD: our Sky engineer told us the Mini boxes aren't 4K compatible, something the spec sheets back up, so multi-room 4K may still be some way off. While Pokemon Go has everybody excited about augmenting reality, some gamers are getting to experience unreality that's so real it's really, er, real. The astonishing GTA 5 Redux completely overhauls the game's weather, shaders, textures and effects with incredible results, and it makes the PS4 and Xbox One versions look like they're running on Etch-A-Sketch. Meanwhile, over at ID Software they've added support for the Vulkan graphics API to make Doom considerably more doomy. Unlike the GTA 5 Redux, the benefits of Vulkan tech won't be limited to PC players either: Vulkan is cross-platform, and should deliver on other operating systems, on consoles and even on mobile devices.